After last week, our extracted DNA samples were amplified with PCR and the finished product brought this week to lab for us to purify and prepare for Sanger sequencing. The first step we took this week was to analyze the success of PCR using gel electrophoresis. The primers used for PCR were selected to amplify the 16S ribosomal rRNA gene (which we learned is commonly used in prokaryote phylogenetics) so samples that had been successfully amplified had a band of DNA in same location in the gel. Some samples were not successfully amplified by PCR: of 33 samples we had 10 negative results. After identifying the 23 good samples, we wanted to perform a “cleanup” step to remove the primers, proteins, and DNA base pairs that were used in PCR. To do this we used a kit very similar to the DNeasy kit we used for extraction. We took each sample and added it to some buffer in a small silica spin column, and centrifuged the sample. We washed it with another buffer and centrifuged twice, throwing away the wash liquid afterwards. After these washes, we eluted the DNA with a third buffer. Now in solution could be sent to be sequenced. However, as a last step we used a Qubit fluorometer to see how much DNA we managed to get. 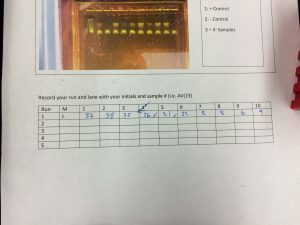 As a class, our yields were a lot lower than expected: on average we had 15% of the DNA we should have purified in an ideal cleanup of the PCR product. Many things could have caused this: there was a lot of waiting for the centrifuge or pipettes, and the intricate steps of the cleanup process provided a lot of room for error. While disappointing, we learned a lot about troubleshooting. Once again this week proved to be an edifying experience in laboratory research, providing us with hands on skill development in team collaboration, procedural technique, and utilization of the scientific method.